A perfect day to me in NYC during the summer is laying out at the Gansevoort hotel rooftop pool and going to Shake Shack at Madison Square Park for an early dinner with my girlfriends lol. 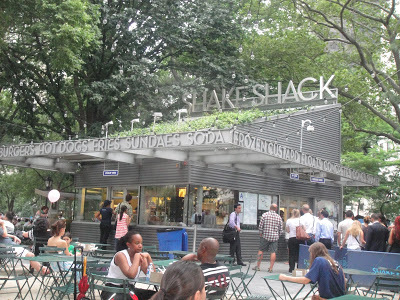 Shake Shack is like LA’s In ‘N Out burger lol. In ‘N’ Out is probably the most famous “cheap” burger on the west coast, and Shake Shack is also a fast food burger chain in New York City that everyone loves. Shake Shack has more options than In’ N’ Out as far as burgers/toppings, fries and milkshakes, but the menu is fairly simple too. There is always a long line for Shake Shack so be prepared to wait! 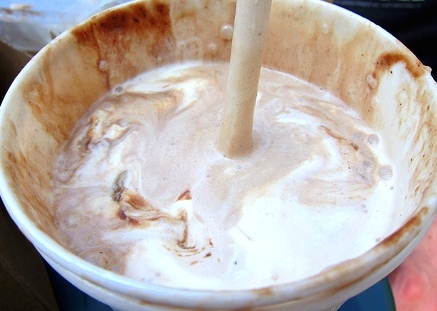 Had to try a milkshake type thing at Shake Shack. They have a bunch of different milkshakes, custards & floats. This was great…very rich. Can’t wait to try something else next time, you can even design your own! Nicole, thanks so much for being a guest of Shake Shack. We’re thrilled to be a part of your perfect NYC summer day! Our team can’t wait to see you again soon at the Shack!